* Congressman Holt & anthrax « CASE CLOSED … what really happened in the 2001 anthrax attacks? IT WASN’T IVINS !!! THEN WHO WAS IT? A congressional inquiry into the F.B.I.’s scientific work on the anthrax mailings of 2001 has identified major gaps in genetic evidence that purportedly links the germs to Bruce E. Ivins, the Army microbiologist blamed for attacks that killed five people, sickened 17 others and shook the nation. The Government Accountability Office study, requested in 2010 and made public on Friday, echoes earlier criticism from the National Academy of Sciences. In 2011, its expert panel found that the bureau’s analysis of the genetic evidence “did not definitively demonstrate” a firm link between the mailed anthrax spores and a sample taken from Dr. Ivins’s laboratory at Fort Detrick in Maryland, and more generally was “not as conclusive” as the bureau had asserted. The G.A.O. had better access to F.B.I. records and deepened the genetic critique, finding that the bureau’s investigation “lacked several important characteristics” that could have strengthened its case. “A key scientific gap,” the 77-page report said, was the bureau’s failure to investigate whether samples of anthrax spores could naturally mutate enough to obscure their putative links to Dr. Ivins. In 2008, shortly after he killed himself, the bureau laid out a sweeping but circumstantial case against Dr. Ivins, an Army microbiologist, saying he had acted alone in conducting the nation’s first major bioterrorist attack. It called the case Amerithrax and said that unique mutations in the anthrax spores had helped put Dr. Ivins under the spotlight. The bureau said it agreed with the G.A.O.’s advice on improving its forensic science. Mr. Holt has repeatedly called for a national commission on the anthrax mailings that would serve as a kind of scaled-down version of the panel that studied the terrorist attacks of Sept. 11, 2001. The anthrax letters were sent from a mailbox in Princeton, N.J., which is in his district. The deadly wisps of anthrax, coming just after the September attacks, set off new waves of panic. Over the years, a growing number of outside expertshave asked whether federal investigators got the right man and whether the F.B.I.’s long inquiry brushed aside important clues. 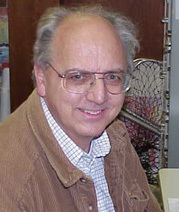 Martin E. Hugh-Jones, an authority on anthrax at Louisiana State University, said the report was disappointing. * Congressman Rush Holt has raised questions about the FBI investigation of the anthrax attacks for years … He has asked the GAO to investigate … but no answers are forthcoming … is the GAO now part of the coverup? For years, Congressman Rush Holt has raised questions about the FBI investigation of the anthrax attacks. He has called for Congressional reviews. 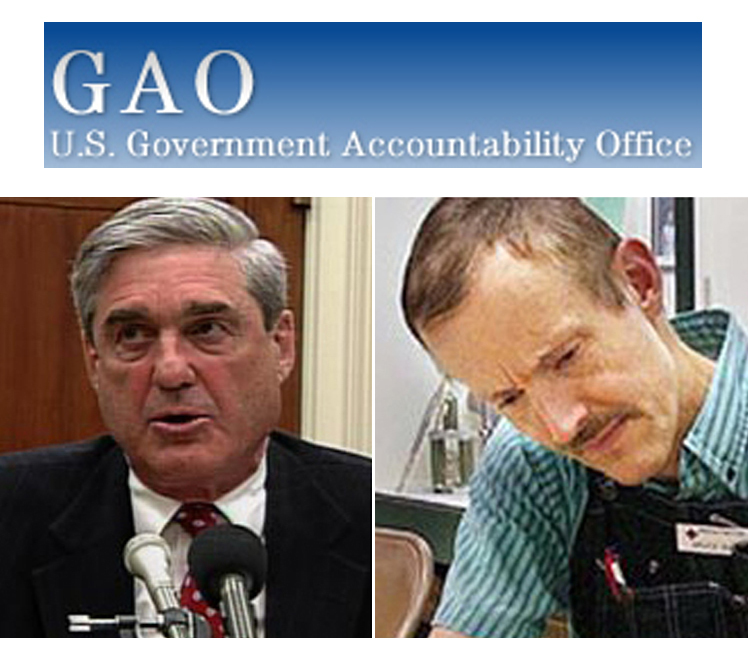 He has asked the GAO to investigate. But nothing has happened. No reports have issued. The FBI’s Ivins case has been thoroughly demolished on this blog and elsewhere. Does anyone still care about what seems to be an enormous coverup of the truth regarding the 2001 anthrax attacks? The only thing we know with almost total certainty is that it wasn’t Dr. Bruce Ivins. 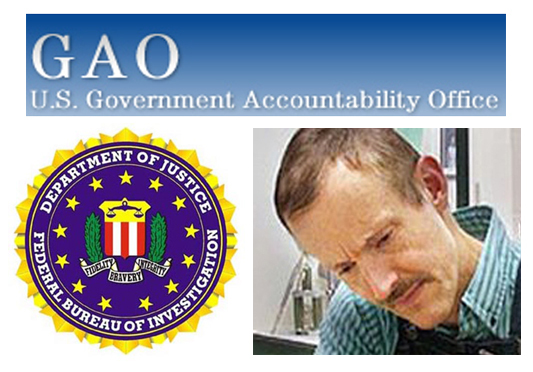 * the GAO review of the FBI’s anthrax investigation has begun … a report is expected to be issued by September 30, 2011 … *** UPDATE: a series of fascinating comments to this post suggest many pertinent questions that GAO might want to consider . * Trentonian (10/20/13) … Congressman Rush Holt: “Myriad questions remain about the anthrax attacks and the government’s response to the attacks. The anthrax probe at first came to focus intensely on government scientist Stephen Hatfill. The federal government eventually awarded him $5.8 million to settle a lawsuit charging that the massive investigation had violated his constitutional rights. The investigative chase in 2005 started down a new trail, this time in pursuit of Bruce Ivins, another government scientist. In July 2008 he committed suicide with an overdose of Tylenol. A month later the FBI declared him the sole suspect behind the anthrax letters. On Feb. 19, 2010, it officially closed the investigation, declaring Ivins the perpetrator. The FBI said psychological profiles, damning unrefuted circumstantial evidence, and Ivins’ own evasive or false statements to agents all pointed to his guilt. Most damning of all, said the FBI, was the fact that Ivins had access to anthrax identical to that dropped in the Princeton mailbox. Other scientists who had access were able to fully account for their whereabouts and their handling of anthrax in their labs. But Ivins, according to the FBI, never gave a straight story on why in the nights leading up to the attack he logged late hours in his government lab at Ft. Detrick, Md. has been thoroughly refuted on this blog and elsewhere. The skeptical Holt, however, balks at signing off on the official conclusion to the investigation. There were no fingerprints, no witness accounts, no physical evidence linking Ivins to the incident, says Holt. The case against him was “entirely circumstantial,” and the FBI director personally acknowledged as much to him, the congressman says. The FBI “arbitrarily” closed the case based on evidence that “would not, I think, stand up in court,” he adds. on its ongoing review of the FBI’s investigation for years. Where is their report? What/who is holding it up? Despite bipartisan backing, however, the Democratic Holt’s legislation has never progressed beyond the confines of the House Judiciary Committee. Staff sources of both parties say there’s a reluctance on Capitol Hill to be seen as second-guessing law enforcement, especially the FBI, and a dread of unwittingly encouraging endless conspiracy speculations such as the assassination of President Kennedy inspires to this day. and the government’s response to the attacks,” insists Holt. LMW NOTE … There are only three possible explanations for the FBI’s continued unsupported assertion that Dr. Ivins was the sole perpetrator of the anthrax attacks (or that he was involved at all). Frontline, partnering with McClatchy and ProPublica, has done important work in assessing the FBI’s conclusion in Amerithrax. 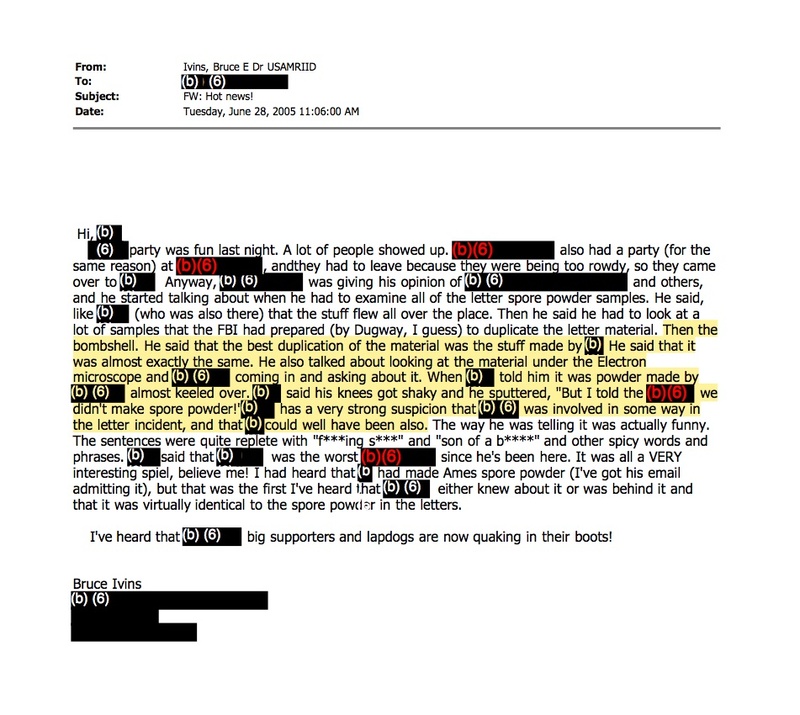 by Gary Matsumoto, Special to ProPublica, April 23, 2010, 11:45 a.m. The “Hatfill Theory” was part of the same unstoppable train wreck as the “Ivins Theory.” There was a change of cars (investigators), but it was the same flawed train of reasoning and the investigators never overcame the earlier truncated emphasis of the investigation. In a Sept 23, 2011 letter to Senator Grassley, the DOJ says that Dr. Ivins made the dried powder in B5 using the lyophilizer even though the DOJ has proved he was in B3 tending to the rabbits, not B5 (the BL-2 lab), at the time the DOJ alleges he made the dried powder. THAT is the contradiction. Baltimore Sun/Frontline … if Ivins was not the person who sent the anthrax, then that killer is still on the loose … and we are left with an FBI that not only failed to solve such a huge case, but overstated and maybe lied about what it did accomplish. Was FBI too quick to judge anthrax suspect the killer? The FBI says it has evidence showing that Bruce Ivins was behind the 2001 anthrax attacks — but with his death, this will not be tested in court. A full enquiry into the case is needed if justice is to be done. Feb 16, 2011 – A scientific panel concludes the Government overstated its genetic evidence against Bruce Ivins. PR’s John Dankowsky interviews Stephen Engleberg, Paul Keim and David Relman … RELMAN: the evidence linking the anthrax material in the letters to the material in the flask in Bruce Ivins’ lab was consistent with an association but was not conclusive or definitive … KEIM: there’s no scientific test that can prove that it came from Fort Detrick, Maryland. former USAMRIID scientists Jeff Adamovicz and Gerry Andrews … “The scientific evidence clearly shows that the (anthrax) wasn’t produced in our laboratory (USAMRIID).” … ie, IT WASN’T IVINS!!! •Feb 27, 2010 – The Federal Bureau of Investigation’s report on Dr. Bruce Ivins leaves too many loose ends to be taken as a definitive verdict. by Mike Wiser, PBS Frontline, Greg Gordon, McClatchy Newspapers, and Stephen Engelberg, ProPublica, July 18, 2011, 7:03 p.m.
an article by Drs. Hugh-Jones, Rosenberg & Jacobsen highlights key unanswered questions in the FBI anthrax investigation … such as where and how were the anthrax spores in the attack letters prepared? Iowa Sen. Charles Grassley, the ranking Republican on the Senate Judiciary Committee, says it would take a powerful grassroots movement or startling new evidence to reopen the Justice Department’s investigation that branded a now-deceased Army researcher as the anthrax mailer who killed five people a decade ago. Rep. Rush Holt, D-N.J., who has criticized the FBI investigation as “botched” and from whose district the deadly letters were mailed, said he may try for a third time to win support for legislation creating a special commission to investigate the attacks. 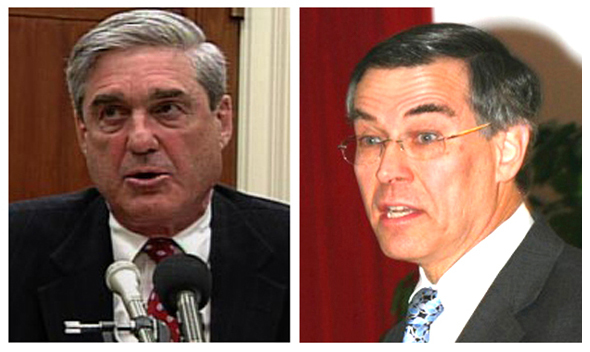 FBI Director Mueller continues to stonewall Congress and the American people regarding the FBI’s investigation of the 2001 anthrax attacks. Despite continuing and compelling evidence that the FBI’s case against Dr. Bruce Ivins is not supported by anything but flimsy innuendos and weak circumstantial evidence, the FBI will not, so far, move from its pedantic repetition of its assertion that Dr. Ivins was the sole perpetrator. It is frightening that, in a democracy, the national police force has so much power over the people’s elected representatives. The FBI, in this case, is behaving more like the KGB than like a srvrant of the American people. They won’t answer questions asked by Congress. They won’t release documents they have no right to keep hidden. And they surely will give no credence to the ongoing demolition of their pathetic case against Dr. Ivins. I have been furious about the FBI’s behavior ever since watching the August 2008 press conference where they asserted, with no physical evidence, no witnesses, and (it turns out) no science, that Bruce Ivins was the sole perpetrator of the anthrax attacks. It was clear to me the FBI had not even proven that Ivins was involved, let alone that he was the sole perpetrator. Being a novelist, I wrote a novel, presenting what I (and others, including a respected representative of the U.S. Intelligence Community) thought was a plausible scenario of what might have happened. My novel CASE CLOSED has been published and is available in paperback and kindle formats on amazon. did not, in fact, have the technical skill needed to manufacture the spores. The team claims that the particles of tin and silicone found in the anthrax spores are not random contaminants. Instead, they argue, the particles are indicators of the complex coating used in the mass production of pharmaceutical products. These recent findings come less than a year after the National Academy of Sciences issued a review that criticized the FBI’s scientific analysis of the anthrax spores. New Jersey Rep. Rush Holt has also condemned the FBI’s handling of the investigation … Holt has called for a commission, styled after the 9/11 commission, to investigate the mailings. I (have long been) concerned about the processes and professionalism of government investigators. The FBI’s practices for taking evidence, I saw, were sloppy and even illogical. One of the FBI’s first steps, for instance, should have been to examine immediately all of the mailboxes that fed into the Trenton mail facility where the letters were known to have been processed. Yet nine months passed before the FBI swabbed public mailboxes and identified a contaminated public mailbox on Nassau Street in Princeton as the apparent source of the letter. Only then did the FBI begin asking passers-by whether they remembered anything unusual happening at that box the previous fall. For years, the FBI investigation focused myopically on Steven Hatfill, a bioweapons expert, even after it became clear that Hatfill lacked access to the strain of anthrax used in the attacks. Hatfill later sued the Department of Justice, and he settled for $5.8 million. while the real culprit or culprits remained at large. 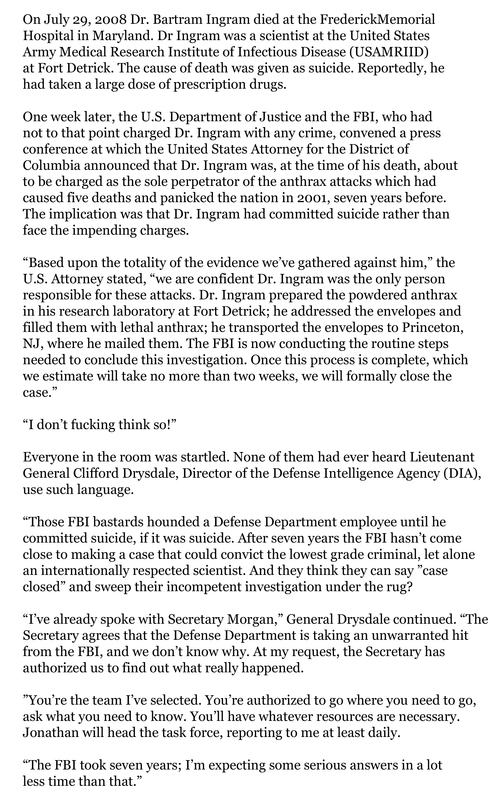 Finally, after the better part of a decade of false leads and vague public statements, the FBI announced in August 2008 that it had identified a suspect: Dr. Bruce Ivins, a vaccine specialist who worked at Fort Detrick and who days earlier had committed suicide. the case against Ivins was almost entirely circumstantial. On the basis of this (circumstantial) evidence, the FBI declared that Ivins was the culprit, that he had acted alone and that the investigation into the anthrax attacks was considered closed. any direct, physical evidence tying Ivins to the attack. Further investigations, including a report from the National Research Council, have cast questions on whether the FBI conclusively demonstrated that the anthrax used in the attack originated in Ivins’ lab. Indeed, as the NRC report noted, multiple individuals had access to the flask that allegedly contained the attack material. And Ivins had no experience in making, nor the proper equipment to produce, the kind of refined, easily aerosolized spores that were used in the attacks. In Congress, I have introduced legislation that would create a special committee, modeled after the 9/11 Commission, to investigate the anthrax attacks, including our pre-attack preparations, the incidents, the public health response, the forensic response and the subsequent improvements made. Such an investigation would help us understand what really happened, why and whether America has grown better prepared to deter biological attacks. can be traced directly to the panic induced by the anthrax mailings. Our sense that terrorists were everywhere, that even an action as innocent as opening the mail could be fatal, set the United States on a path that will haunt us for years. The FBI has clearly failed to solve the anthrax case, and is just as clearly trying to stonewall any attempts to get to the truth. FBI Director Robert Mueller needs to be brought on the carpet to explain his management of this case and to tell the American people the truth about the anthrax attacks.